Luckily for us, we have friends. Not only is the mommy of the household ~technically~ not supposed to drive, but all parks, shopping and things of general interest are at least 10 minutes away by car. It can leave little girls and their mommies feeling a liiiiittle isolated. So, as we stated, luckily we have friends. Sara and Zach arranged to spend their entire Wednesday with us and it was heavenly. The kiddos ran around our living room and had a blast. Zach even brought some of his toys for us to play with while we await “real” housing and the arrival of our own. The crowning glory of our napless afternoon was a trip to the apartment complex pool. The munchkins mostly wanted to run around and take full advantage of the wet feet/slippery pavement combo. Strangely, we avoided any abrasions/head injuries. 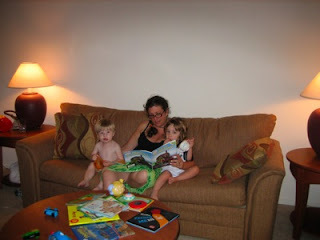 Afterward, everyone was tired and we returned to our apartment for stories and supper. A wonderful day all around. We are lucky to have such good friends!